Actual lease price determined by your authorized Porsche dealer; your payments may vary. Closed-end lease offered to qualified lessees with approved credit by Porsche Financial Services through participating U.S. dealers. Must take delivery by 4/30/2019. 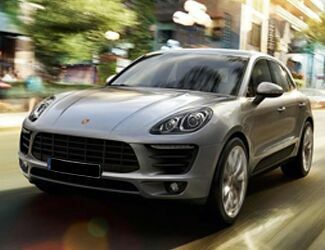 Estimated payments based upon MSRP of $58,830 (includes delivery, processing, and handling fee) for a Model Year 2018 Macan with the following options: Metallic Paint, Roof Rails in Black, 20-inch RS Spyder Design Wheels, Wheel Center Caps with Colored Porsche Crest, Power Seats (14-way) with Memory Package, Seat Heating (Front), Adaptive Cruise Control, Sunblind for Rear Side Windows, Steering Wheel Heating, BOSE® Surround Sound System. Model pictured may have optional features and equipment. Price excludes any title, taxes, registration, license fees, insurance, maintenance and dealer fees. Lease payments of $699.19 for 36 months total $25,170.84 based on the adjusted capitalized cost of $52,760 (requires dealer contribution which could affect price). Total due from customer at signing $5,129.19 (first month’s payment, acquisition fee of $995 and capitalized cost reduction of $3,435). No security deposit required. At lease end, lessee pays excess wear, $.30/mile over 30,000 miles and $350 disposition fee. Purchase option at lease end $35,886 plus taxes. Specific vehicles and options are subject to availability and your price may vary. For additional information see your participating authorized Porsche dealer or visit Porsche.com/usa. Clean CARFAX. * Still Under Factory Powertrain Warranty**, Sunroof/Panoramic Roof, Backup Camera, Bluetooth, Hands-Free, Heated Seats, COOLED SEATS, Keyless Entry, Leather Seats, 4D Sport Utility, 2.0L I4 Turbocharged, 7-Speed Porsche Doppelkupplung (PDK), AWD, Grey, Black Leather, Front Seat Ventilation, Illuminated entry, Lane Change Assist (LCA), Leather Shift Knob, Monochrome High-Gloss Black Exterior Package, Panoramic Roof System, Porsche Entry & Drive, Power Liftgate, Premium Package Plus, Wheels: 18" Macan S. Priced below KBB Fair Purchase Price! 2018 AWD Porsche Certified. Macan Grey 2.0L I4 Turbocharged 7-Speed Porsche Doppelkupplung (PDK) 4D Sport Utility Odometer is 3230 miles below market average! Clean CARFAX. *Still Under Factory Warranty**, Still Under Factory Powertrain Warranty**, Sunroof/Panoramic Roof, Backup Camera, Bluetooth, Hands-Free, Heated Seats, COOLED SEATS, 4D Sport Utility, 2.0L I4 Turbocharged, 7-Speed Porsche Doppelkupplung (PDK), AWD, Grey, Gray Leather, BOSE Surround Sound System, Front Seat Ventilation, Illuminated entry, Monochrome High-Gloss Black Exterior Package, Porsche Entry & Drive, Premium Package Plus, Wheels: 18" Macan. 2018 AWD Porsche Certified. Macan Grey 2.0L I4 Turbocharged 7-Speed Porsche Doppelkupplung (PDK) 4D Sport Utility Odometer is 2183 miles below market average! With some options like Monochrome High-Gloss Black Exterior Package, Premium Package Plus (Front Seat Ventilation and Porsche Entry & Drive), 4D Sport Utility, 2.0L I4 Turbocharged, 7-Speed Porsche Doppelkupplung (PDK), AWD, Grey, Gray Leather, BOSE Surround Sound System, Illuminated entry, Wheels: 18" Macan, 14-Way Power Seats, 4-Wheel Disc Brakes, 8 Speakers, 8-Way Power Seats, ABS brakes, Air Conditioning, AM/FM radio: SiriusXM, Automatic temperature control, Automatically Dimming Exterior Mirrors, Automatically Dimming Interior Mirrors, Axle Ratio: 4.13, Bi-Xenon Lighting System w/PDLS, Brake assist, Bumpers: body-color, CD player, Delay-off headlights, Driver door bin, Driver vanity mirror, Dual front impact airbags, Dual front side impact airbags, DVD-Audio, Electronic Stability Control, Exterior Parking Camera Rear, Four wheel independent suspension, Front & Rear Heated Seats, Front anti-roll bar, Front Bucket Seats, Front Center Armrest, Front dual zone A/C, Front fog lights, Front reading lights, Fully automatic headlights, Garage door transmitter: HomeLink, Headlight cleaning, Heated door mirrors, High intensity discharge headlights: Bi-Xenon, Knee airbag, Leather Shift Knob, Low tire pressure warning, Memory Pkg, Occupant sensing airbag, Outside temperature display, Overhead airbag, Overhead console, Panic alarm, Panoramic Roof System, Partial Leather Seat Trim w/Alcantara, Passenger door bin, Passenger vanity mirror, Porsche Communication Management, Porsche Connect, Power door mirrors, Power driver seat, Power Liftgate, Power passenger seat, Power steering, Power windows, Radio data system, Rain sensing wipers, Rear air conditioning, Rear anti-roll bar, Rear reading lights, Rear seat center armrest, Rear side impact airbag, Rear window defroster, Rear window wiper, Remote keyless entry, Security system, Speed control, Speed-sensing steering, Split folding rear seat, Spoiler, Sport steering wheel, Steering wheel mounted audio controls, Tachometer, Telescoping steering wheel, Tilt steering wheel, Traction control, Trip computer, and Variably intermittent wipers! (Not all options may be on this vehicle due to automated process)Porsche Approved Certified Pre-Owned Details: * * 111 Point Inspection * Warranty Deductible: $0 * Roadside Assistance * Transferable Warranty (between private parties) * 2 year/Unlimited miles beginning after new car warranty expires or from certified purchase date. Includes Trip Interruption reimbursementLoeber Motors prides itself in being one of Chicagoland’s most prolific luxury car dealerships. With a robust selection of Porsche vehicles on hand. Chicago, IL car shoppers have plenty to choose from when they step on the Loeber Motors lot. Luxury cars like the Porsche 911 Porsche Cayenne, many of the industry’s most incredible vehicles call Loeber Motors home. While we are based in Lincolnwood, we are proud to serve the entire Chicagoland community, including Evanston, Northbrook, Park Ridge and many other nearby locations. In the search for a new, certified or pre-owned Porsche, Loeber Motors remains a go-to location for luxury car shoppers. Clean CARFAX. *Still Under Factory Warranty**, Still Under Factory Powertrain Warranty**, Sunroof/Panoramic Roof, Backup Camera, Bluetooth, Hands-Free, Heated Seats, COOLED SEATS, Keyless Entry, Leather Seats, 4D Sport Utility, 2.0L I4 Turbocharged, 7-Speed Porsche Doppelkupplung (PDK), AWD, Grey, Black Leather, BOSE Surround Sound System, Front Seat Ventilation, Monochrome High-Gloss Black Exterior Package, Porsche Entry & Drive, Premium Package Plus, Wheels: 19" Macan Turbo. 2018 AWD Porsche Certified. Macan Grey 2.0L I4 Turbocharged 7-Speed Porsche Doppelkupplung (PDK) 4D Sport Utility Odometer is 1449 miles below market average! With some options like Monochrome High-Gloss Black Exterior Package, Premium Package Plus (Front Seat Ventilation and Porsche Entry & Drive), 4D Sport Utility, 2.0L I4 Turbocharged, 7-Speed Porsche Doppelkupplung (PDK), AWD, Grey, Black Leather, BOSE Surround Sound System, Wheels: 19" Macan Turbo, 14-Way Power Seats, 4-Wheel Disc Brakes, 8 Speakers, 8-Way Power Seats, ABS brakes, Air Conditioning, AM/FM radio: SiriusXM, Automatic temperature control, Automatically Dimming Exterior Mirrors, Automatically Dimming Interior Mirrors, Axle Ratio: 4.13, Bi-Xenon Lighting System w/PDLS, Brake assist, Bumpers: body-color, CD player, Delay-off headlights, Driver door bin, Driver vanity mirror, Dual front impact airbags, Dual front side impact airbags, DVD-Audio, Electronic Stability Control, Exterior Parking Camera Rear, Four wheel independent suspension, Front & Rear Heated Seats, Front anti-roll bar, Front Bucket Seats, Front Center Armrest, Front dual zone A/C, Front fog lights, Front reading lights, Fully automatic headlights, Garage door transmitter: HomeLink, Headlight cleaning, Heated door mirrors, High intensity discharge headlights: Bi-Xenon, Illuminated entry, Knee airbag, Leather Shift Knob, Low tire pressure warning, Memory Pkg, Occupant sensing airbag, Outside temperature display, Overhead airbag, Overhead console, Panic alarm, Panoramic Roof System, Partial Leather Seat Trim w/Alcantara, Passenger door bin, Passenger vanity mirror, Porsche Communication Management, Porsche Connect, Power door mirrors, Power driver seat, Power Liftgate, Power passenger seat, Power steering, Power windows, Radio data system, Rain sensing wipers, Rear air conditioning, Rear anti-roll bar, Rear reading lights, Rear seat center armrest, Rear side impact airbag, Rear window defroster, Rear window wiper, Remote keyless entry, Security system, Speed control, Speed-sensing steering, Split folding rear seat, Spoiler, Sport steering wheel, Steering wheel mounted audio controls, Tachometer, Telescoping steering wheel, Tilt steering wheel, Traction control, Trip computer, and Variably intermittent wipers! (Not all options may be on this vehicle due to automated process)Porsche Approved Certified Pre-Owned Details: * * Roadside Assistance * 111 Point Inspection * Warranty Deductible: $0 * 2 year/Unlimited miles beginning after new car warranty expires or from certified purchase date. Includes Trip Interruption reimbursement * Transferable Warranty (between private parties)Loeber Motors prides itself in being one of Chicagoland’s most prolific luxury car dealerships. With a robust selection of Porsche vehicles on hand. Chicago, IL car shoppers have plenty to choose from when they step on the Loeber Motors lot. Luxury cars like the Porsche 911 Porsche Cayenne, many of the industry’s most incredible vehicles call Loeber Motors home. While we are based in Lincolnwood, we are proud to serve the entire Chicagoland community, including Evanston, Northbrook, Park Ridge and many other nearby locations. In the search for a new, certified or pre-owned Porsche, Loeber Motors remains a go-to location for luxury car shoppers. Clean CARFAX. * Still Under Factory Powertrain Warranty**, Sunroof/Panoramic Roof, Backup Camera, Bluetooth, Hands-Free, Heated Seats, COOLED SEATS, Keyless Entry, Leather Seats, Navigation, 4D Sport Utility, 2.0L I4 Turbocharged, 7-Speed Porsche Doppelkupplung (PDK), AWD, White, Black Leather, 14-Way Power Seats, Front Seat Ventilation, Lane Change Assist (LCA), Memory Pkg, Navigation Module for PCM, Panoramic Roof System, Porsche Entry & Drive, Premium Package Plus, Smoker Package, Sport steering wheel, Wheels: 19" Macan Turbo. CARFAX One-Owner. 2018 AWD Porsche Certified. Macan White 2.0L I4 Turbocharged 7-Speed Porsche Doppelkupplung (PDK) 4D Sport Utility With some options like Premium Package Plus (Front Seat Ventilation and Porsche Entry & Drive), Smoker Package, 4D Sport Utility, 2.0L I4 Turbocharged, 7-Speed Porsche Doppelkupplung (PDK), AWD, White, Black Leather, 14-Way Power Seats, Lane Change Assist (LCA), Memory Pkg, Navigation Module for PCM, Panoramic Roof System, Sport steering wheel, Wheels: 19" Macan Turbo, 4-Wheel Disc Brakes, 8 Speakers, 8-Way Power Seats, ABS brakes, Adaptive Cruise Control, Air Conditioning, AM/FM radio: SiriusXM, Automatic temperature control, Automatically Dimming Exterior Mirrors, Automatically Dimming Interior Mirrors, Axle Ratio: 4.13, Bi-Xenon Lighting System w/PDLS, BOSE Surround Sound System, Brake assist, Bumpers: body-color, CD player, Delay-off headlights, Driver door bin, Driver vanity mirror, Dual front impact airbags, Dual front side impact airbags, DVD-Audio, Electronic Stability Control, Exterior Parking Camera Rear, Four wheel independent suspension, Front & Rear Heated Seats, Front anti-roll bar, Front Bucket Seats, Front Center Armrest, Front dual zone A/C, Front fog lights, Front reading lights, Fully automatic headlights, Garage door transmitter: HomeLink, Headlight cleaning, Heated door mirrors, High intensity discharge headlights: Bi-Xenon, Illuminated entry, Knee airbag, Leather Shift Knob, Low tire pressure warning, Occupant sensing airbag, Outside temperature display, Overhead airbag, Overhead console, Panic alarm, Partial Leather Seat Trim w/Alcantara, Passenger door bin, Passenger vanity mirror, Porsche Communication Management, Power door mirrors, Power driver seat, Power Liftgate, Power passenger seat, Power steering, Power windows, Radio data system, Rain sensing wipers, Rear air conditioning, Rear anti-roll bar, Rear reading lights, Rear seat center armrest, Rear side impact airbag, Rear window defroster, Rear window wiper, Remote keyless entry, Roof Rails in Black, Security system, Speed control, Speed-sensing steering, Split folding rear seat, Spoiler, Steering wheel mounted audio controls, Tachometer, Telescoping steering wheel, Tilt steering wheel, Traction control, Trailer Coupling w/o Removable Ball Joint, Trip computer, and Variably intermittent wipers! (Not all options may be on this vehicle due to automated process)Porsche Approved Certified Pre-Owned Details: * * Transferable Warranty (between private parties) * Warranty Deductible: $0 * 2 year/Unlimited miles beginning after new car warranty expires or from certified purchase date. Includes Trip Interruption reimbursement * Roadside Assistance * 111 Point InspectionLoeber Motors prides itself in being one of Chicagoland’s most prolific luxury car dealerships. With a robust selection of Porsche vehicles on hand. Chicago, IL car shoppers have plenty to choose from when they step on the Loeber Motors lot. Luxury cars like the Porsche 911 Porsche Cayenne, many of the industry’s most incredible vehicles call Loeber Motors home. While we are based in Lincolnwood, we are proud to serve the entire Chicagoland community, including Evanston, Northbrook, Park Ridge and many other nearby locations. In the search for a new, certified or pre-owned Porsche, Loeber Motors remains a go-to location for luxury car shoppers.